Rap superstar and Senegal transplant, Akon gave a proposal to the US government to restore power to Puerto Rico in just 30 days. They turned him down and many people are still without power five months later. 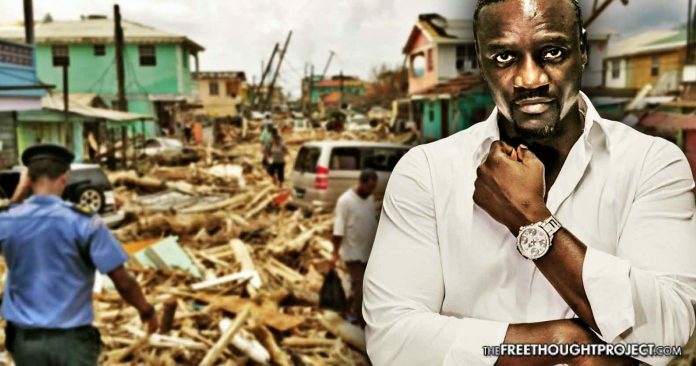 Rap superstar, and Senegal transplant, Akon says his organization, Akon Lighting Africa, could’ve restored power in Puerto Rico five months faster than the government, but they did not let him. Now, this singer is speaking out. On Saturday, in an impromptu interview with TMZ, Akon said that he presented a program through his organization to quickly restore power to Puerto Rico after the island was struck by Hurricane Maria in September. In the wake of the hurricane, the entire country was left without power. Akon said that if the US government cared about the people of Puerto Rico, he could’ve given back their power in a month. Instead, it has been over five months and many people still do not have power. “We actually presented a program for Puerto Rico and we got rejected. We have the solution for Puerto Rico…. and we could’ve had power back in 30 days. And they rejected us,” said Akon. As to why the government rejected his plan, Akon alluded to the corruption within Washington that gives contracts like these to special interests who make billions on the taxpayer’s dime—also known as corporate welfare. “It’s politics, propaganda, and special interests. They didn’t care about the people—if that was the case, they would have allowed us to go in and provide the solution,” Akon said. According to Newsweek, power has been restored to 83.8 percent of Puerto Rico, but top officials are still unhappy with the recovery process post-Hurricane Maria. Lieutenant General Todd Semonite, the commanding general of the U.S. Army Corps of Engineers, said on Wednesday during an interview with the Pentagon that he was dissatisfied with the recovery process of the island post-Hurricane Maria. Akon is no stranger to restoring electricity and when he says he could’ve restored power, his track record backs him up. As TFTP reported in 2016, realizing that access to electricity is one of the key components to increasing the quality of life, Akon decided to take action and put his money where his mouth is. The transformative effects that a single group has had in the region are nothing short of astonishing and speaks to the nature of the decision to refuse to allow Akon to restore power to Puerto Rico. On the contrary, other contractors were given billions of taxpayer dollars to “aid” in the recovery efforts only to be caught swindling taxpayers. US Rep. Elijah Cummings and Stacey Plaskett, the congressional delegate from the US Virgin Islands, signed a letter to House Oversight Committee Chairman Trey Gowdy, calling into question a $156 million contract awarded to a small Atlanta-based company, Tribute Contracting LLC, according to CNN. For their $156 million dollar price tag, Tribute Contracting promised to deliver 30 million meals to starving Puerto Ricans. However, the company only came through with 50,000 meals, delivering just 0.25 percent of their end of the bargain. To put that into perspective, each one of those meals cost the US taxpayer $3,120. In the meantime, however, a company with a proven track record of restoring power while creating a market for energy and jobs using very little government funding, is turned down. This is why we can’t have nice things.